Rasumofsky, Gräfin Konstanze (geb. Thürheim), österr. Adelige (1785-1867). 6 eigenh. Briefe m. Unterschrift. Rauscher, Joseph Othmar Ritter von, österr. Kardinal u. Erzbischof von Wien (1797-1875). 2 eigenh. Briefe m. Unterschrift. BRETON DE LA MARTINIÈRE, Jean-Baptiste-Joseph. La Russie, ou moeurs, usages, et costumes des habitans de toutes les provinces de cet empire.Paris, Nepveu, 1813. 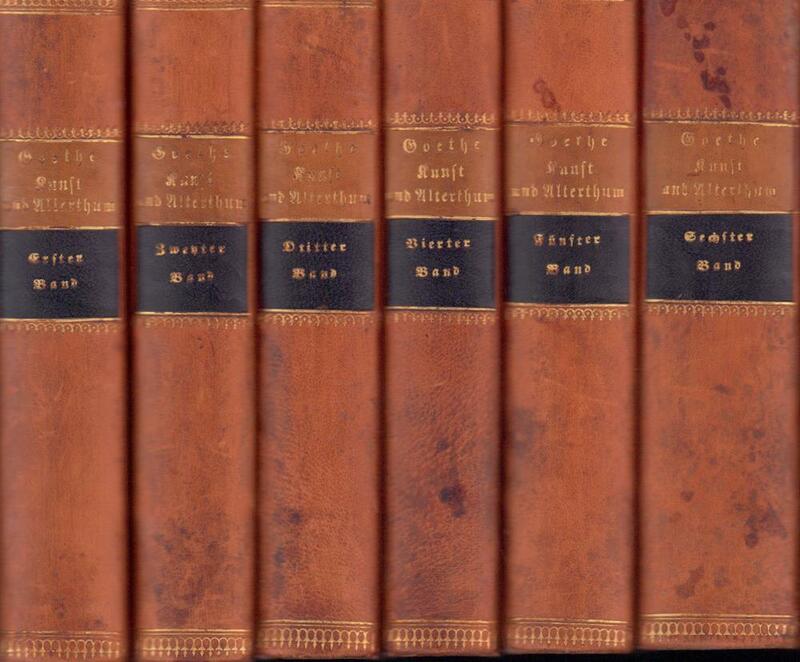 6 volumes. 12mo. With 113 engraved plates (4 folding facing title-pages of volumes 1-4, 1 double-page, 108 full-page), all but 6 in lovely hand-colouring. Contemporary gold-tooled red half sheepskin. Brunet I, col. 1226; Colas 436; Hiler, p. 113; Lipperheide Kaa 29. First edition of Breton de la Martinière's picturesque representations of the dress and manners of the inhabitants of the Russian empire. 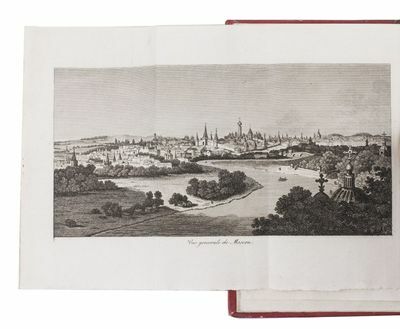 With numerous plates showing views of Moscow and the Kremlin, the Palace of Petrowski, inhabitants of various cities in their characteristic dress (Riga, Ochta, Valday), Cossacks, a settlement of Kalmouks, army officers, etc. 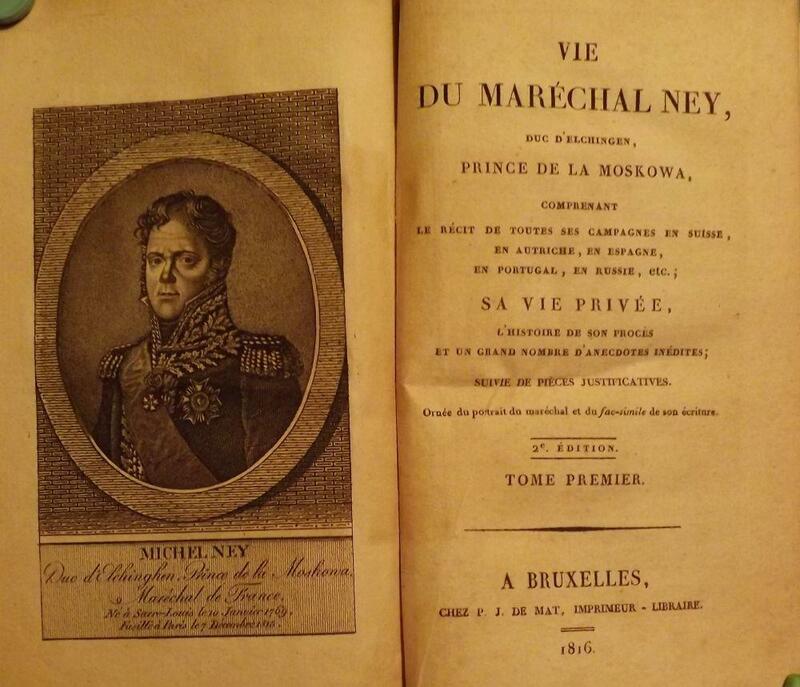 A German edition appeared in 1816. Some plates browned, some spotting, overall in very good condition. Very attractive set of hand-coloured Russian costume plates. Anfangsgründe der Gymnastik oder Turnkunst. The Works of Samuel Johnson. With An Essay on his Life and Genius, by Arthur Murphy. London: Printed for Nichols and Son, etc., 1816. 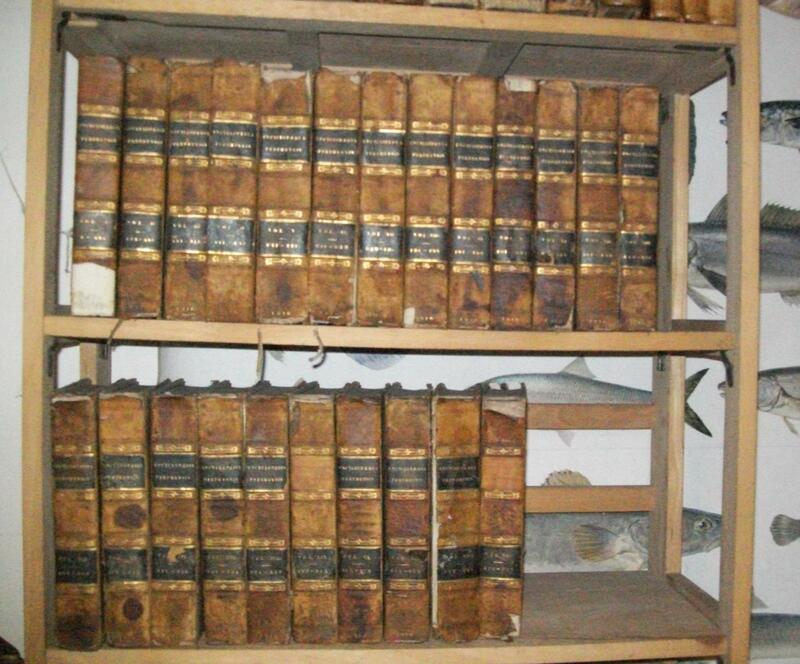 12 volumes; 8vo (8½ x 13 inches). 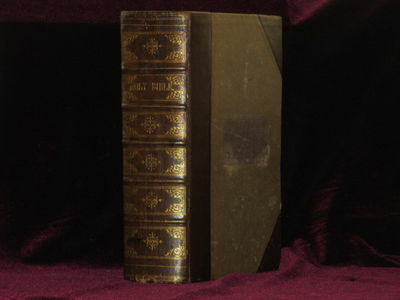 Contemporary tan half calf with raised bands, gilt and two black title labels to spines; marbled boards and edges; green end papers. Portrait frontispiece to volume one. Bookplates. Boards a little rubbed; spines darkened evenly; light occasional foxing. 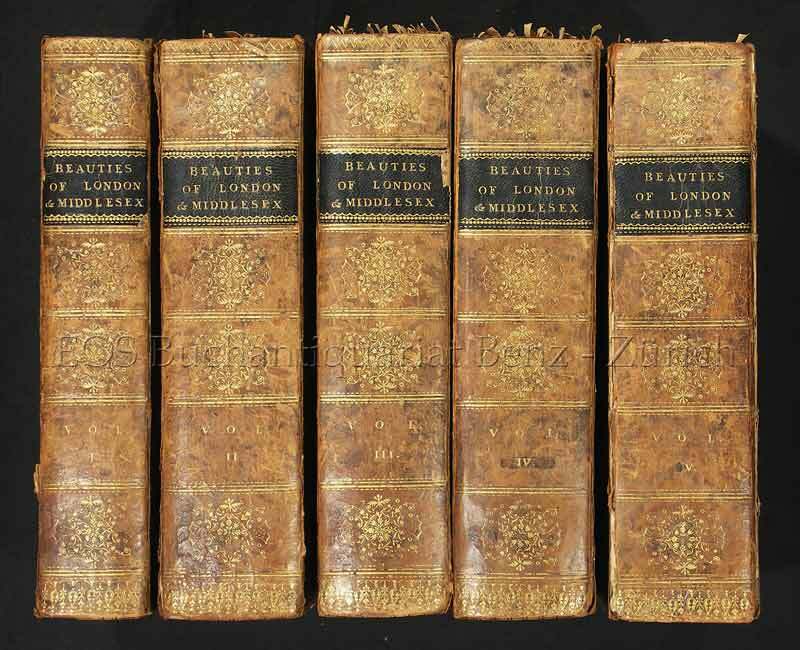 A very attractive and sound set in a highly decorative old leather binding. Fu il fuoco, o l'acqua che sotterro Pompei ed Ercolano? Scoperta geologico-istorica, fatta dall'autore il di 14 e 26 Ottobre 1810, e da lui scritta nelle lingue latina, inglese, francese, italiana, tedesca, e spagnuola in due lettere. Seguite dalle scritture pro et contra, presentate all' Accademia di scienze di Napoli, per di lei ordine; e dalle decisioni di questa Società, relative al' argomento. Prima edizione Italiana. The Beauties of England and Wales or Delineations Topographical Historical and Descriptive. - London and Middleesex. London, Vernor, Hood and Sharpe, 1810-1816. - 5 Bände (von 18). 8°. Mit 5 gest. Titeln und 134 Stahlstichtafeln. Lederbände der Zeit mit Rücken- und Deckelverg. Durchgehend stärker braun- und stockfleckig. Einband berieben und bestossen. Gelenke teilw. angeplatzt. Lederbezug am Rücken von Band eins über die ganze Breite eingerissen. 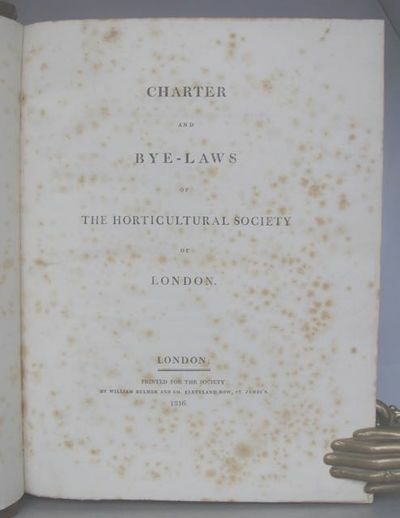 Charter and bye-laws of the Horticultural Society of London. London: printed for the Society by William Bulmer and Co. 1816. 4to., vi + 50pp., title and following leaf foxed, contents leaf with repaired closed tear, bound in good contemporary half calf over marbled boards, spine fully gilt with contrasting labels, rebacked with the original spine laid down. Apparently very rare, COPAC finding no copy printed earlier than 1820 (in 8vo.) Lowndes (Appendix p.141) concurs.> [bound with], Horticultural Society of London, May 1, 1817. Subjects for the medals and rewards.> [London] printed by W. Bulmer and Co., n.d. . 4to., drophead title, 3 + (1)pp. A very good copy. Rare: no other copy traced. [bound with], Horticultural Society of London. Statement relative to the establishment of a garden; drawn up for the information of the Members of the Society, by the Council. February, 1822.> London, printed by W. Nicol. n.d. . 4to., 11 + (1)pp., possibly wanting a half-title. Rare: not in COPAC. [bound with], Horticultural Society of London. Report of the Garden Committee on the formation and progress of the garden; drawn up for the information of the Fellows of the Society, as directed by the bye-laws. March 31, 1823.> London: William Nicol. 1823. 4to., (2) + 26pp., folding engraved plan dated April 1823, a little offset. Copy in BL but no other in COPAC. [bound with], Horticultural Society of London. Report of the Garden Committee on the formation and progress of the garden; drawn up for the information of the Fellows of the Society, as directed by the bye-laws. March 31, 1824.> London: William Nicol. 1824. 4to., (2) + (6) + 3 - 19 + (1)pp. Copy in BL but no other in COPAC. 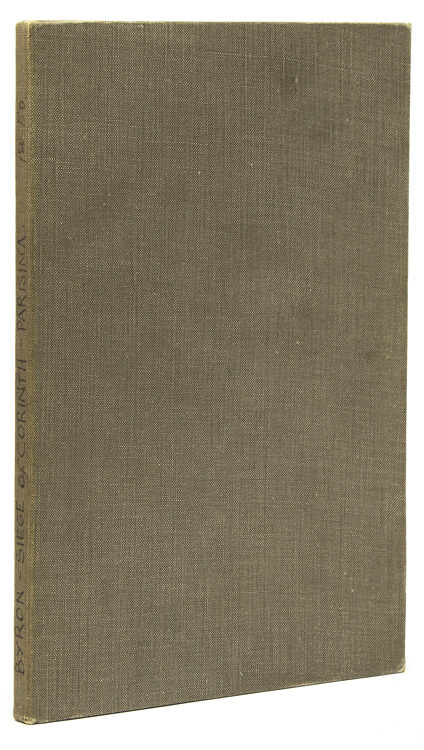 [bound with] Bye-laws for the garden of the Horticultural Society of London.> London: printed for the Society, by W. Nicol. 1822. 8vo., (4) + 15 + (1)pp. Rare: but copies found at BL + Bodleian + St. Andrews. [bound with], Horticultural Society of London. Report of the Garden Committee on the formation and progress of the garden; drawn up for the information of the Fellows of the Society, as directed by the bye-laws. March 31, 1825.> London: William Nicol. 1825. 4to., 20pp. [bound with], Horticultural Society of London. Report of the Garden Committee on the formation and progress of the garden; drawn up for the information of the Fellows of the Society, as directed by the bye-laws. March 31, 1826.> London: William Nicol. 1826. 4to., 29 + (1)pp., with a large folding engraved plate (Plan of the Arboretum in the garden of the Horticultural Society at Chiswick. March 1826>), this a little offset. [bound with], LIST> of the Horticultural Society of London.> July, 1816. 4to., 11 + (1)pp. [bound with], LIST> of the Horticultural Society of London.> January, 1819. 4to., 28pp. [bound with], LIST> of the Horticultural Society of London.> May, 1820. 4to., 44 + (2)pp. 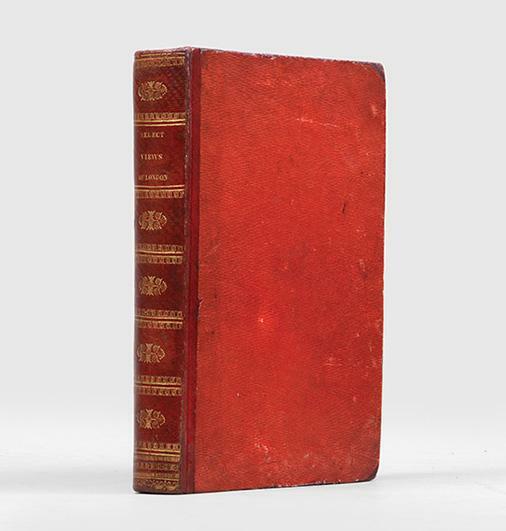 [bound with], LIST> of the Horticultural Society of London.> May, 1821. 4to., 55 + (1) + 2 + (2)pp. [bound with], LIST> of the Horticultural Society of London.> May 1, 1823. 4to., 72pp. [bound with], LIST> of the Horticultural Society of London.> May 1, 1824. 4to., 77 + (1)pp. [bound with], LIST> of the Horticultural Society of London.> May 3, 1825. 4to., 81 + (1)pp. [bound with], LIST> of the Horticultural Society of London.> May 2, 1826. 4to., 84pp., last couple of leaves foxed. A fine collection of rare material from the early years of what was from 1861 to be the Royal Horticultural Society. This volume was compiled by Lieut. General Sir James Affleck (1759-1833) of Dalham Hall, Newmarket,> who was then a Fellow of the Society, the volume bearing his signature in several places. As the 1816 Charter> declares, 'the foundations of a Society in London to promote the delightful science of horticulture, were laid in the year 1804, by a number of skilful gardeners, and other experienced men, who were anxious to direct to a common centre, the various springs of horticultural knowledge in their own vicinity, as well as to collect from more distant sources such information as the gardeners of other countries might be induced to communicate'. Histoire naturelle des crustacés des environs de Nice. Ornées de gravures. 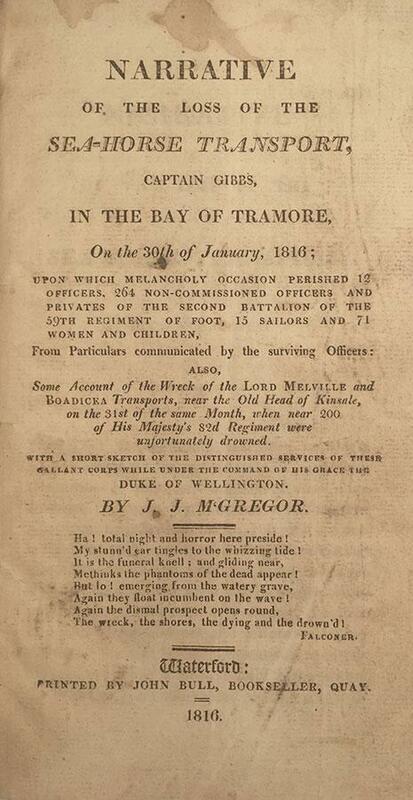 Narrative of the Loss of the Sea-Horse Transport, Captain Gibbs, in the Bay of Tramore, On the 30th of January, 1816; upon which melancholy occasion perished 12 officers, 264 non-commissioned officers and privates of the Second Battalion of the 59th Regiment of foot, 15 sailors and 71 women and children, from particulars communicated by the surviving officers : also, some account of the wreck of the Lord Melville, and Boadicea transports, near the Old Head of Kinsale, on the 31st of the same month, when near 200 of His Majesty's 82d Regiment were unfortunately drowned : with a short sketch of the distinguished services of these gallant corps while under the command of His Grace the Duke of Wellington. Ueber die Seeräuber im Mittelmeer und ihre Vertilgung. Ein Völkerwunsch an den erlauchten Kongreß in Wien. Mit den nöthigen historischen und statistischen Erläuterungen.Lubeck, M. Michelsen, 1815. 8vo. 19th-century boards covered with paste-paper. - Allgemeine Zeitung (Stuttgart), no. 46 (19 April 1816), p. 185. First and only edition (the first of two issues) of a detailed report on the pirates in the Mediterranean Sea, giving some historical information, but primarily concerned with the infamous "Barbary" pirates then still active off the coasts of Algiers, Morocco and Tunis (the Barbary Coast), along with accounts of the Christian slaves that were still held in these regions. 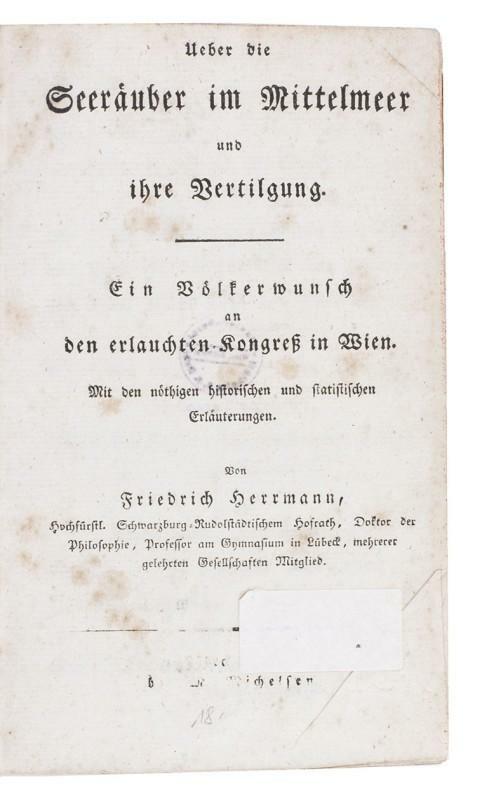 Herrmann presented this work to the Congress of Vienna to convince the representatives of the importance and urgency of bringing the piracy to an end. The Congress did set up an anti-piracy commission to discuss the problem of the Barbary pirates, but the issue remained unsettled and was addressed again at the 1818 Congress of Aix-la-Chapelle. There too, the necessary international cooperation proved difficult and the piracy continued until the French conquest of Algiers in 1830.With a library's ownership inscription on the front paste-down and a stamp on the back of the title-page. With the imprint damaged, or label and with minor foxing, but otherwise in good condition. With the paste-paper scuffed and torn, but the binding remains structurally sound. A plea for a solution to the piracy problem at the end of the Napoleonic Wars. Ueber Kunst und Alterthum. 6 Bde. (= komplett). 2.a Hoja que comprehende la parte de Costa de Tierra Firme e Islas adyacentes. 2.a Hoja que comprehende la parte de Costa de Tierra Firme e Islas adyacentes. Direccion de Hidrografia, 1816 [c.1866]., Madrid, - Venezuela, showing Caracas & CuraÃ§ao Engraved chart, with the Direccion de Hidrografia blindstamp. 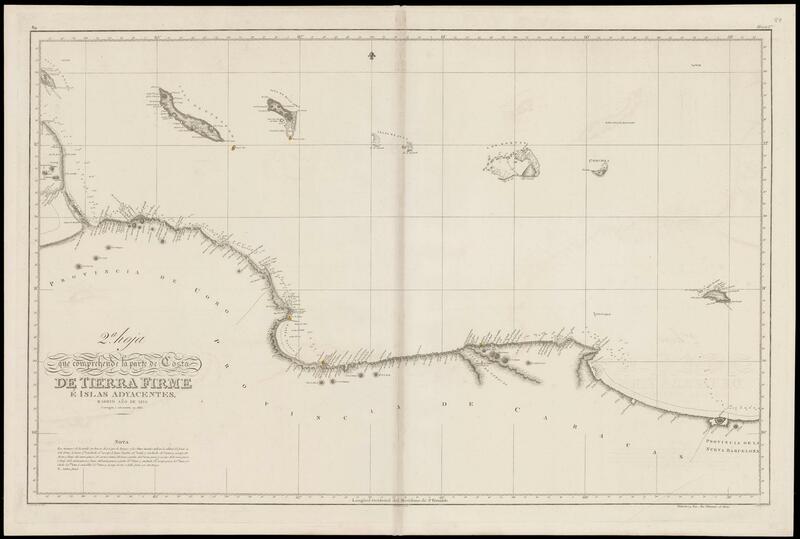 A detailed chart of the Caribbean coast of Venezuela, showing Caracas, CuraÃ§ao and Aruba. The lighthouses are marked with colour. 650 by 900mm (25.5 by 35.5 inches). The traveller?s Guide in Switzerland. Being a complete picture of that interesting Country. 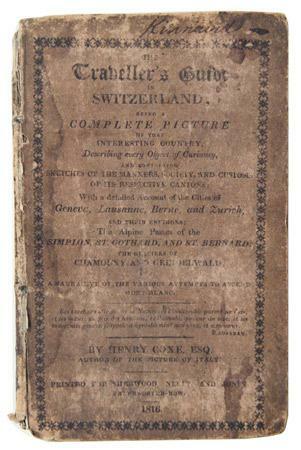 the Alpine Passes of the Simplon, St. Gothard and St. Bernard; the Glaciers of Chamouny and Grindelwald; and a narrative of the various attempts to ascent Mont Blanc. 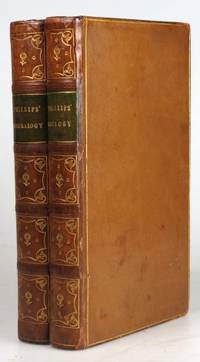 London: John Murray,, 1816 & 1817. 2 works in 1, octavo. Contemporary half calf, spine gilt-rolled into compartments with floral and lyre gilt tools and red morocco title label, marbled sides, blue speckled edges. Front joint partially cracked but holding strong, wear to edges, extremities rubbed, the marbled paper scruffed in places; a very good copy. First editions, with the half-titles,of The Prisoner of Chillon (first issue, with recto of final leaf blank and verso with list of poems) and of Manfred (third issue, with the Hamlet quotation to title page). 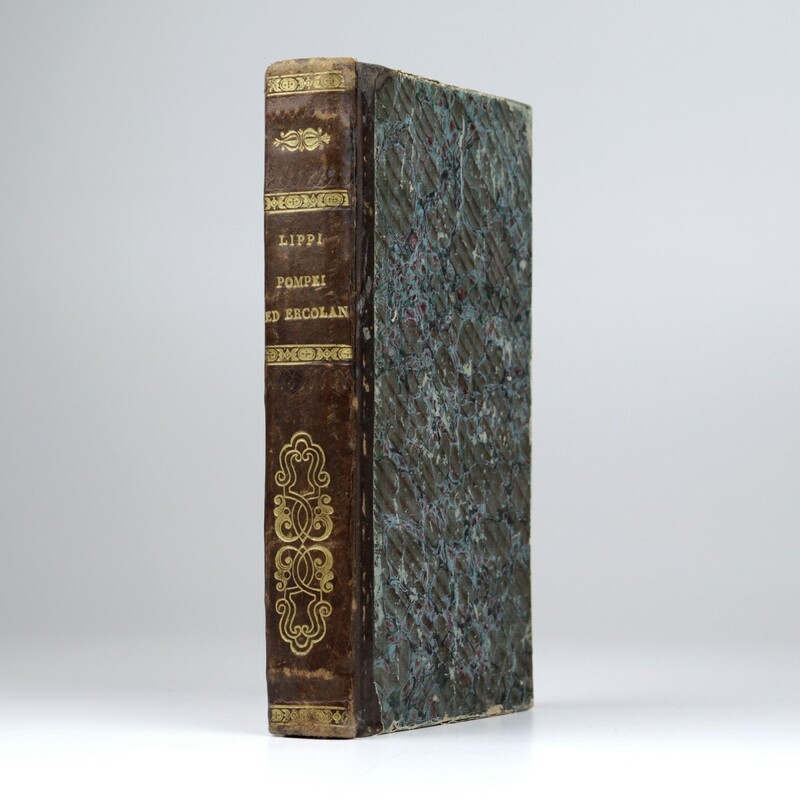 This volume combines, in attractively tooled contemporary calf and marbled boards, two of Byron's influential early publications. The Prisoner of Chillon (1816) contains creations largely resulting from Byron's summer spent in Switzerland with Percy Bysshe and Mary Shelley, most notably the long titular poem relating the imprisonment and starvation of 16th-century monk François Bonivard inspired by a visit to his prison in the Castle of Chillon on Lake Geneva, and the eschatological fantasy "Darkness" (which was Byron's contribution to the same ghost-story writing competition that resulted, most famously, in Frankenstein). Manfred, published a year after, was Byron's striking Faustian drama of a magician's refusal to bow to his spiritual masters; it inspired a number of paintings (by John Martin and Thomas Cole) and musical compositions (by Schumann, Tchaikovsky, and even Nietzsche). This copy has, laid-in, an autograph letter signed from John Murray IV (18511928  the grandson of Byron's publisher) on Albermarle Street stationery, dated 9 August 1899. The letter is addressed to Rev. Canon F. Meyrick (18271906), who had studied at Trinity College, Oxford, and was President of the Oxford Union in 1849. He was a prolific author of theological works, several of which were published by John Murray. The letter discusses the relative rarity of Byron first editions, and the desirability of copies "in their original state". The ownership inscriptions of other members of the Meyrick family appear on the title page. Itinerario Istruttivo da Roma a Napoli Ovvero Descrizione generale de' più insigni Monumenti antichi e moderni e delle Opere più rimarchevoli di pittura, scultura, ed architettura di questa celebre città e delle sue vicinanze. Terza edizione Corretta ed Accresciuta dall' Autore medesimo. Roma, Presss l'Autore, 1816. Orig. stif decorated wrappers. Printed titlelabel on spine preserved. IX,(3),264 pp., 32 engraved plates and 2 folded msaps (1. Travelling map - 2. City plan of Napoli). Clean and fine, printed on good paper. Quarante-Huit Heures de Garde au Chateau des Tuileries, Pendant les Journées des 19 en 20 Mars 1815, ou Précis Historique Des Evènemens qui ont eu lieu pendant ces deux jours, Accompagné de Deux Gravures, Et Dedié a la Garde Nationale. VILLARS, D. / Lascelles, R. / ZSCHOKKE, J. H. D.
1) Précis d'un voyage botanique fait en Suisse. (20,5:13 cm). 4 gravures dépl. sur cuivre, 2 ff. + 64 p. + 1 f. / Relié avec: 2) (R. Lascelles). Scizze einer mahlerischen Reise durch die Schweiz. Aus dem Englischen eines Ungenannten. Hrsg. u. mit Anm. von J. R. Wyß. Mit gest. Front. u. gest. Titel mit Vign. 3 Bll., 154 S. / Et avec: 3) (J. H. D. Zschokke). Reise auf die Eisgebirge des Kantons Bern und Ersteigung ihrer höchsten Gipfel im Sommer 1812. Mit 1 gefalt. teilkol. Kupferkarte. 45 S.
Select Views anticipates the compilation of another architect, James Elmes' Metropolitan Improvements  in its illustration of the work of contemporaries and topically records the ephemeral structures which appeared in the parks to celebrate the Peace of 1814" (Adams 117). A handsome, untrimmed copy in a strictly contemporary Regency half morocco, possibly the publisher's deluxe binding, notably retaining an advertisement leaf not noted by Abbey or Tooley. Select Views of London. With Historical and Descriptive Sketches of some of the most Interesting of its Public Buildings. BAD AUSSEE - - KLEIN, Anton. Kaisl. Königl. Landesfürstlichen Salzkamerguts Marckt Ausse. Aquarell auf Papier (Bildausschnitt 25 x 42 cm), rechts unten signiert und bezeichnet "Die (?) 21.ten Jänner 1816. Fecit Anton Klein". Papier vorallem im äußeren Rand fachmännisch verstärkt, etwas fleckig. Mit Papierwappen. Passepartouiert, verglast und gerahmt mit schlichten, goldenen Holzleisten (45,5 x 57,5 cm). In keiner uns zugänglichen Bibliographie nachweisbar, ebenso konnten wir über Anton Klein keine Daten feststellen. Nicht bei Wurzbach, ÖBL, Schwarz, Slg. Eckl, Skreiner, Stmk. in alten Ansichten. Hübsches Aquarell des Hauptorte des Ausseerlandes Markt (seit 1285) Bad Aussee. Die gesamte Darstellung von einem schwarzen Tuschstrich umgeben. - Der internationale Luftkurort bildet den wirtschaftlichen und kulturellen Mittelpunkt des Steirischen Salzkammergutes. Am Zusammenfluß der 3 Traunquellflüsse gelegen wird der Ort von dem Zinkenkogel und Sarstein umgeben. Ausse war bereits bei den Kelten und Römern als Salzstätte bekannt. Die Saline existiert seit 1290. Abraham Small. Hardcover. Philadelphia, 1816. 8vo, contemporary calf, xv, 855,  + , 578,  pp. With folding charts. 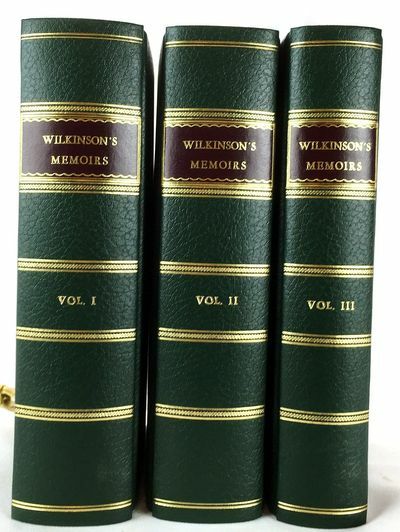 The first two volumes of Wilkinson's memoirs, an important primary source. Institutional library bookplate to front pastedowns, marginal tear to one fold-out. Front board of first volume nearly detached. Contents bright and complete. 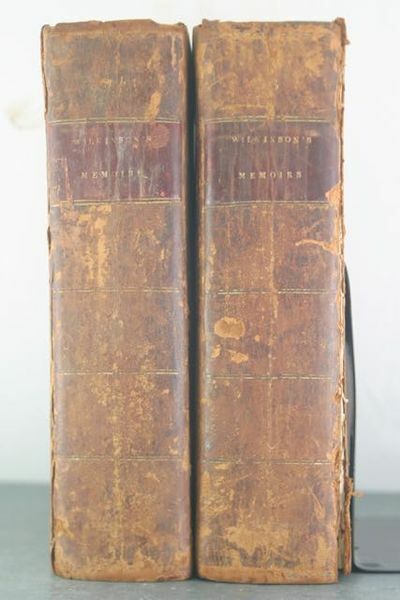 Good copies of the first two of three volumes, lacking the third volume or the atlas. Howes W-429, Sabin 104029 . Good. 1816. First Edition. Observations connected with Astronomy and Ancient History, sacred and profane, on the Ruins of Babylon,: as recently visited and described by Claudius James Rich, Esq., Resident for the East India Company at Baghdad. London Printed for the author 1816 - The Rev. Thomas Maurice, author of Indian Antiquities, was Assistant Librarian at the British Museum. This book was privately published. The plates are: The supposed Ruins of the Tower of Babel; Ancient Inscription on the Walls of Persepolis, &c; The Great Pagoda of Tanjore; A Mexican Temple to the Sun and Moon. A very good copy in original boards, new paper spine. First edition 4to, pp.viii, 164, 4 engraved plates, subscriber list. Philadelphia: Printed by J.M. Sanderson & Co.. 1816. First. First edition. 12mo. , 141,  pp. 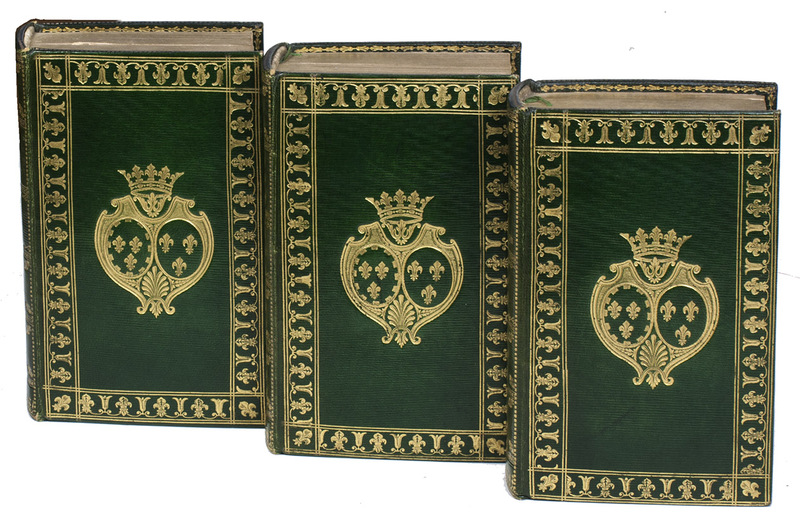 Contemporary quarter leather gilt and paper boards. 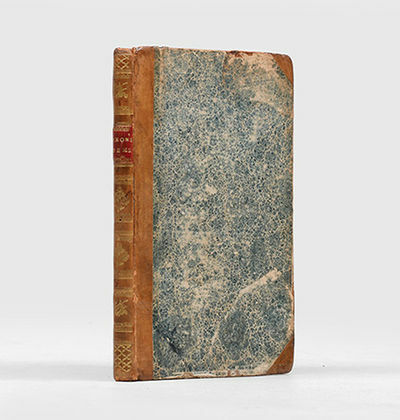 Boards rubbed and worn but a handsome very good copy.Bourne originally came to the United States in 1802 and spent half a dozen years in Baltimore where he engaged in a suit over an issue of freedom of the press, which he won. In 1810 he moved to Virginia and began preaching in the Shenandoah Valley, and in 1812 was ordained a Presbyterian minister serving at South River, Virginia. Bourne was one of the first to call for immediate emancipation in America. His reaction to slaveholding lead him to introduce an anti-slavery motion to the General Assembly which caused him to be ousted from his church. He was among the group that founded the Anti-Slavery Society in 1833. This book documents Bourne's central theme that the bible rejects slavery. William Garrison, one of the leaders of the anti-slavery cause was indebted to Bourne for many of his basic ideas. 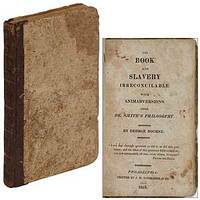 [See Dumond and Christie; George Bourne and the Book and Slavery Irreconcilable].Rare. We could locate six copies: OCLC locates three copies (AAS, Clements, UC Santa Barbara); American Imprints adds three others (Library of Congress, University of Kansas, and the New York State Library). Work, p.317; Dumond, p. 30. Not in LCP/HSP Afro-Americana. Not in Blockson. Sabin 6917. 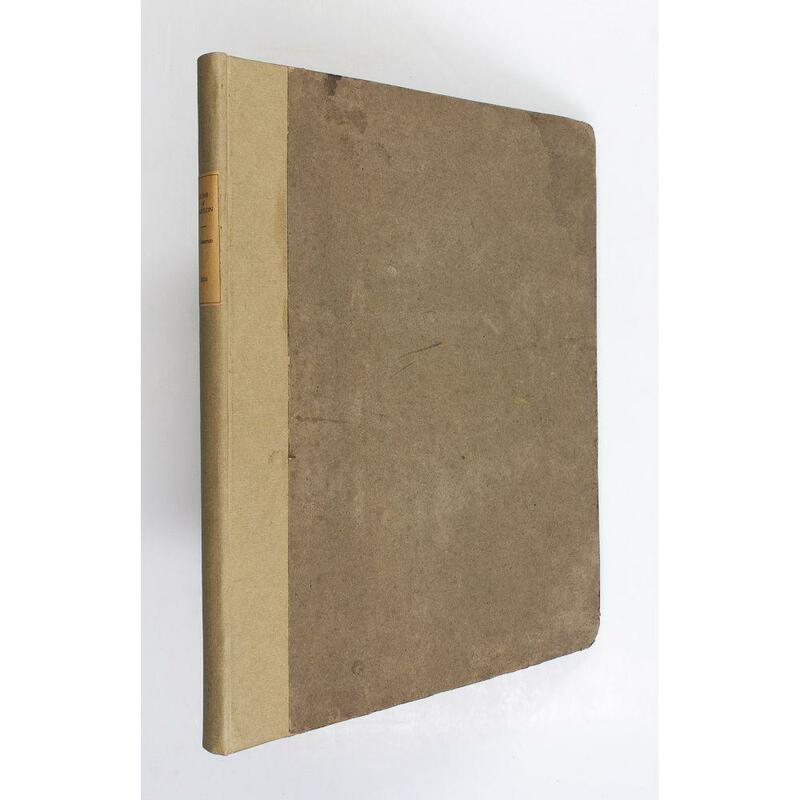 Auction record reveal no copies since at least 1976. .
Manuscript journal of the proceedings of a school district in Saratoga County, New York. Square octavo. Quarter calf and papercovered boards. Approximately 150 pages, of which about 125 have been used. Tears at the joints, some stains in the text, evidence of two leaves partially torn away, a good and readable journal. 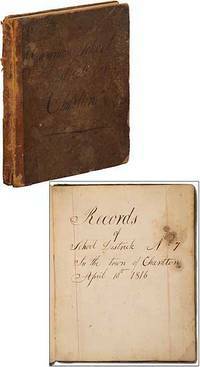 An account of the school district covering the years from 1816 to 1854, composed in various hands, including that of Edward Taylor, brother of John W. Taylor, a longtime legislator and twice Speaker of the U.S. House of Representatives, and other notable pioneers of the area. Charlton was created in 1792, out of the town of Ballston. It was originally called New Freehold because so many of its settlers were from Freehold, New Jersey. .
Kyôchûzan (Mountains of the Heart). (Japan: Sûzan Shobô, 1816). Small quarto. (19)ff. A Japanese book of color woodblock prints by Kameda Bôsai (1754-1826), one of the leading painters of the Nanga or Bunjinga (literati) schools of painting. The seventeen full-page illustrations, five of which extend across the page spread, are landscapes depicting mountainous terrain, comprised of strong, black calligraphic lines with soft colors. Each includes descriptive text printed along the margins and the artist's stamp in red. The images are simple but poetic, expressing the artist's love of the natural world, with descriptions that translate as: "The refreshing sound of a mountain waterfall," "The intoxicating effect of river and mountains," "Solitary fisher on a wintry river," and "Jeweled mountains like sapphires and water like emerald," among others. With a preface and two closing notes. Working during the Edo period, Bôsai was recognized for his paintings, calligraphy, and book illustrations. In her book Block Printing and Book Illustration in Japan, Louise Norton Brown describes Kyôchûzan as "The most charming book produced by the Japanese Impressionistic School." The colophon, which is adhered to the inside of the back cover, has different lettering and paper than the rest of the book. 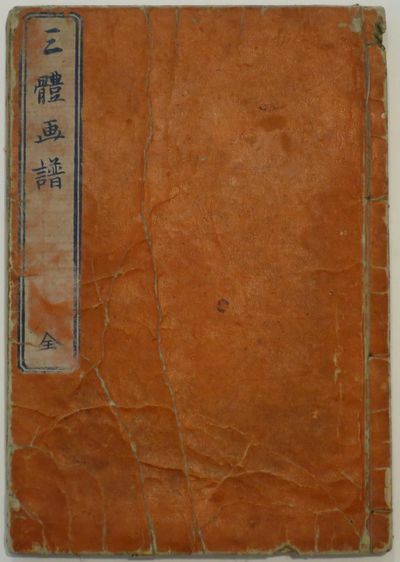 It is dated 1809, in contradiction to the dates stated in the preface and postscripts; according to scholars of Bôsai, this was most likely the result of careless pasting by the bookbinder. Stab-bound in gray-green wrappers with a printed yellow label to the front cover. Covers and one spot on the spine show some light rubbing and wear, else a fine copy. Protected in a blue cloth chemise that closes with bone clasps. (Brown, p. 121; Keyes, #47, p. 283, similar to edition 5; Mitchell, The Illustrated Books of the Nanga, Maruyama, Shijo and Other Related Schools of Japan, pp. 383-4). London: Longman, Hurst, Rees, Orme & Brown. Very Good with no dust jacket. 1816. First Edition. Hardcover. Bound in later full gilt ruled brown calf leather with black morocco. Grey endpapers. Spine length spine label. Solid and tight with an undeniably authentic clipped signature dated 1840 tipprfd in. Sadly the mounting glue has bled through resulting in dark stains on it's face with light offset to title page. Contents firm and clean. The First Edition of Thanksgiving Ode is a rare book. Apparently a large majority of the copies printed were employed, together with Peter Bell, The Waggoner, and The River Duddon to form the supplementary volume [dated 1820] to the Poems of 1815." Healey 38; Wise 14; Tinker 2341. An attractive example with unusually nice text. ; Signed by Author; 0 . 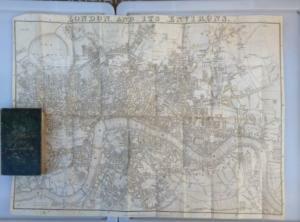 [Both] London: Printed and sold by William Phillips, 1816 & 1818. First editions. Two volumes. 8vo. x, liv, (viii), 325, (13); 240, (10) pp. 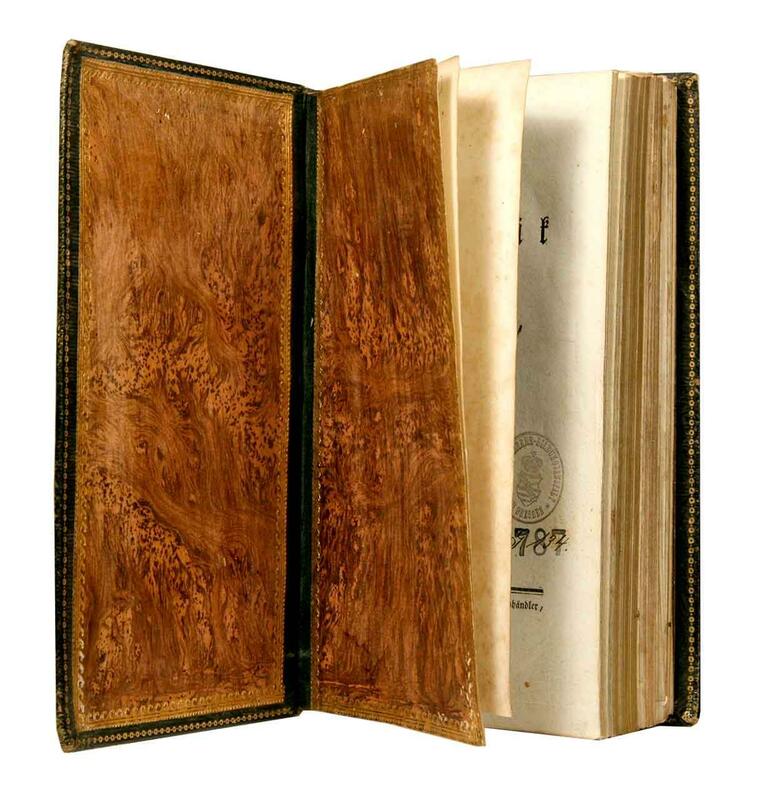 Uniformly bound in brown full polished calf, spines with raised bands, gilt lettered green labels, prettily gilt tooled to the other compartments. The second work with a frontispiece geologically coloured map, a colour plate of strata and a large table delineating the "Order of Superposition of Strata in the British Islands", all folding. Repairs to the upper joints and heads of both volumes, small splits with tissue repairs to the folding table, one small area with just a little loss of text at the lower edge, a lovely set overall. Anleitung zur Kenntnis der Edelsteine und Perlen, als Handbuch fur Juweliere und Steinschneider : nebst einer Beschreibung des Sächsischen Kunstschatzes. Nagoya: Eirakuya Toshiro, No date, ca. 1816 - 1819. 8vo, 29 double leaves, folded, printed from woodblocks in black & gray, with subtle flesh colored highlights, within a single border. Text in Japanese. Original stitched wraps with paper title label. Binding soiled, rubbed & creased, modest edge wear. Internally, label in English mounted to the front pastedown, brief worming in the upper margin affecting several leaves, lightly soiled, occasional creasing, a few leaves with a bit of creasing, certainly Good or better. Described as "cocky, quarrelsome, restless, aggressive, and sensational," Hokusai was the best known and most prolific artist of the Edo period, leaving over 30,000 works. Particularly uncommon, OCLC records 6 holdings with this imprint and 5 others presumably of the period but with variations in imprint. Brattleboro, VT: J. Holbrook's, 1816. Hard Cover. Very Good. Large Quarto. With Marginal Notes and References. To Which are Added, an Index: an Alphabetical Table of all the Names in the Old and New Testaments, with their Significations: and, what has Never Before been Added, an Account of the Lives and Martyrdom of the Apostles and Evangelists.Third Edition. Engraved frontispiece and title page. Engraved title page dated 1816, printed title page dated 1817. 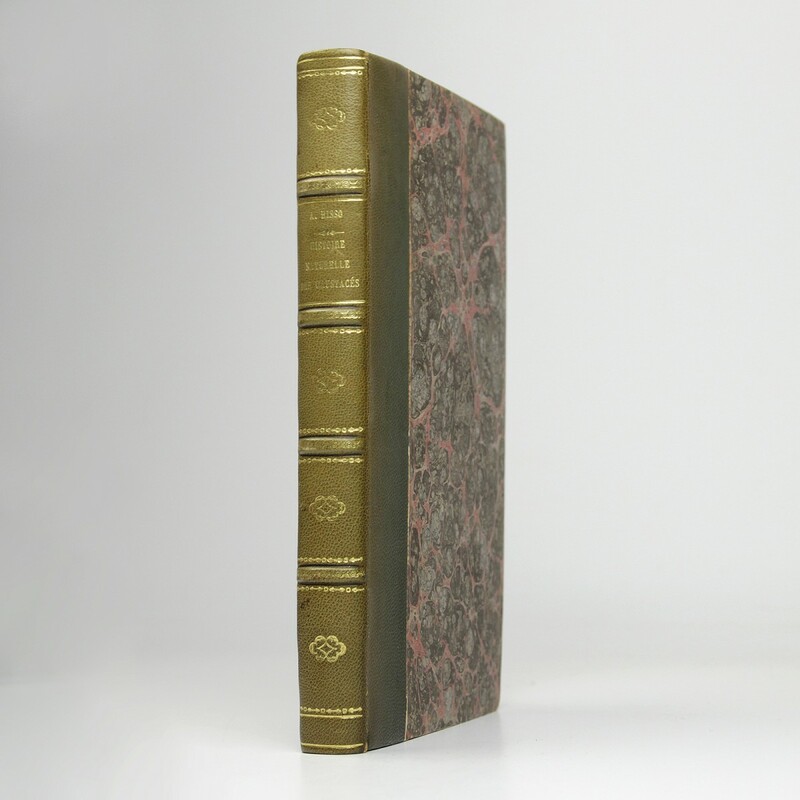 A very good copy bound in three quarter leather and cloth covered boards, raised bands spine, gilt lettering and decoration spine, all edges gilt, marbled endpapers. Many maps and engraved illustrations. Dark spot front cover where label was been removed. Mild cover edge wear, Light scattered foxing. Small hole affecting rfep and last few pages. 931 pp. + Concordance. Folio. unpaginated. About 80 pagespre-printed in journal form, accomplished in manuscript. "John Aborn Master. Kept by Geo. W. Johnson of Providence." The Trumbull departed Jave head May 29 and reached Providence October 26, 1816. Excellent detail on ship handling, weather, and events on board - which included such things as the discovery of a giant whale carcass, being fed on by birds and sharks, "a most tremendous squall" off the Cape of Good Hope, after which "all persons on board [the ship carried passengers as well as cargo] were obliged to help cut away the mizzen mast." Also contacts with English troop ships on the heels of the late War. Approaching the Cape of Good Hope they ran low on water, and the captain was confined to his quarters by rheumatism, much to the relief of the crew. 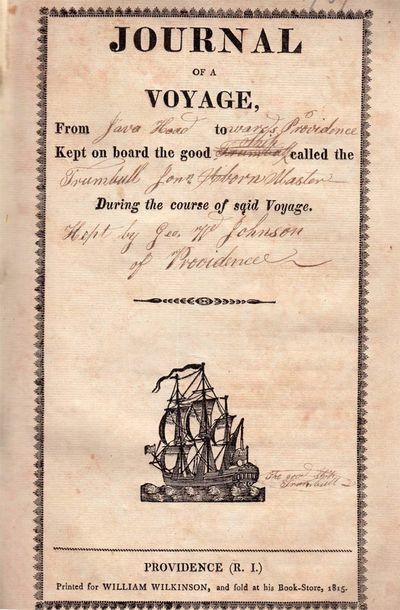 According to journal keeper Johnson, the ship was being run by "our officers." In all, an eventful voyage of an early 19th century American merchantman. 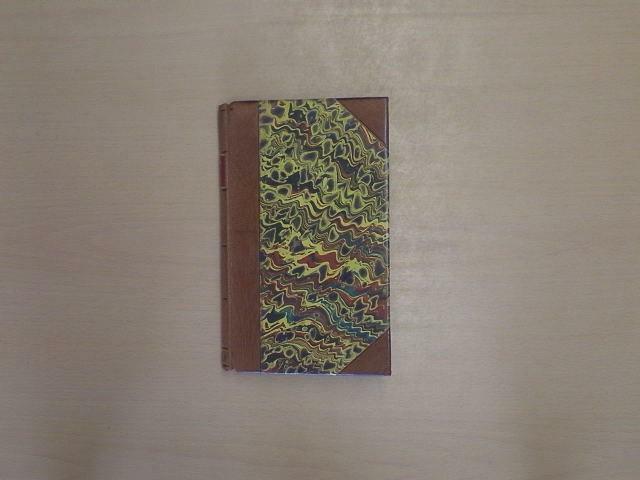 Bound in original marbled wrappers, taped at spine. 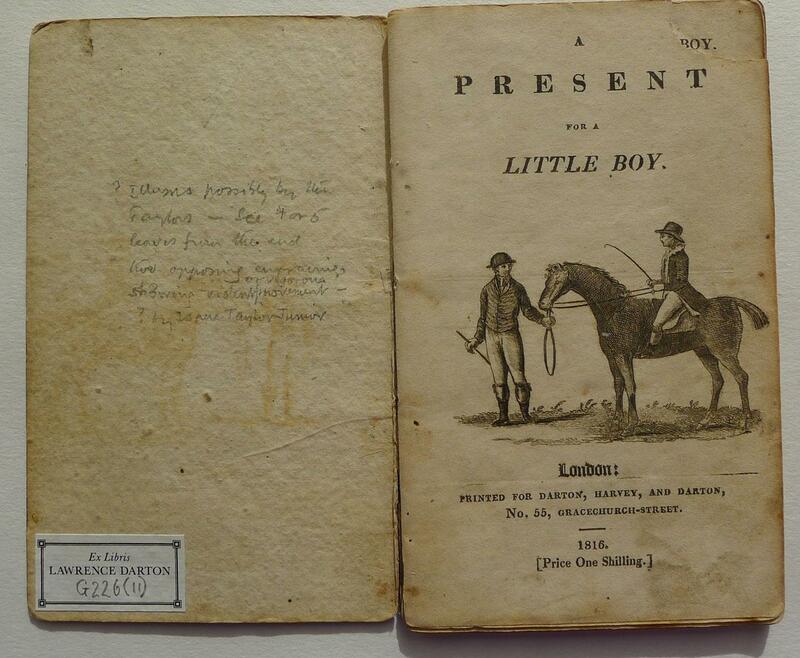 "Providence (R.I.) Printed for William Wilkinson, and sold at his bookstore, 1815."